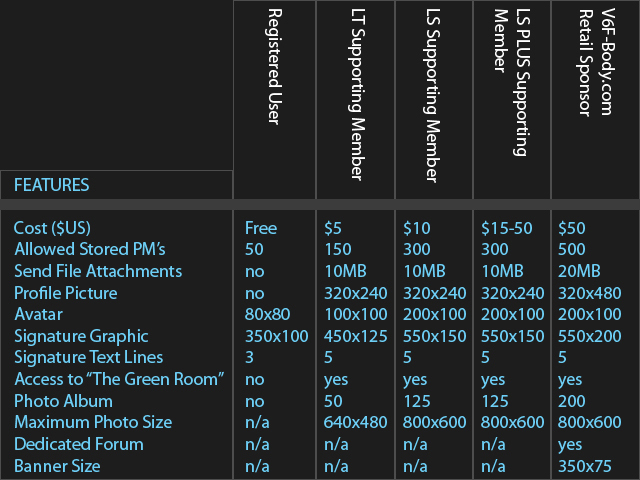 Here are the levels of membership we offer, the costs and what you get. And let's not forget, all memberships will gain you access to the no posting restrictions "Green Room." Anything goes in the Green Room. There is also a new LS PLUS Membership, designed at the request of generous members who wished to donate a little something extra to the cause. Thank you. Become a supporting member by clicking here. Last edited by xpbr2000; 12-04-2014 at 11:27 AM. Updates to LS and LS+ Memberships to inlcude a V6F-Body.com Window Sticker. See details above.